Hello every one, i don't know if it's the good place to post my question. If it's not just tell me where i have to ask it. I have an arduino connected to my laptop, i upload the firmware of lifa on my arduino and i have no problem to communicate with my arduino from labview. I want to receive data from an other arduino (i will name it A2) with a wireless communication. So i bought an Nrf24l01+ which allows me to communicate between my two arduino. I will receive data from many different sensor (actually only two: an IMU gy-521 and some distance sensor hrs04) providing by A2 to A1 with my wireless module. BUT i don't know how to program that on labview, and moreover, i don't know if it's possible to program that on labview. There is no help on the huge spider web so i come to you hopping that you will light my mind. How am i suppose to handdle it ? Do i have to set up some other librairies on labview or arduino, what should i do? Thanks for helping me everyone, i hope i make myself clear, if you have any further question for better answering me i will answer as quickly as possible. Hi im using the arduino uno and altimu-10 v4 to create an AHRS with graphical display indicators. i am starting a project in which a basic PMDC motor with a 2PPR magnetic encoder controlled with a arduino MEGA and a Cytron motor shield MD10 driver i want to control it with the Lab view for basic position control. As i understand LIFA is the interface to be used and LINX also would be an option would it be possible to control it as i intend to control the position of the motor CW and CCW upto a certian degre which will be controlled with the encoder and the program to be built in the LabView. The type of program i am trying to build up is that the motor goes upto a certain angle CW and then halts due to encoder with an interrupt feedback and then goes CCW upto the required angle.and then interrupt stops and then go to home position given by IR sensor. I am a beginner with arduino and labview will this logic be possible as mentioned above or will it have a lot of lapses in counting and operation. Encoder: Magnetic 2ppr on motor. My only concern is the torque required i dont want to control speed or any other factor. I would appreciate your feedback, please inform me if any further info is required . Your feedback will be appriciated. Init.vi. Unable to establish connection with Arduino. Please ensure that you have selected the correct COM port and that you have flashed the Arduino with the correct firmware. I used the maker hub firmware for the arduino and even used a simple led example form maker hub also and it work well. I wrote a program using arduino software alone and stepper motor works. When I used the program example on labview is when the error occurs. Also I try to lowered the Baud rate because in NI-Max it says 9600 (default 115200) and also the bit package to 8 (default 15). I checked the COM in Ni-Max and is the same number in device manager. What might be producing this error any ideas? If you need any extra information I will reply as soon as I can. i want to add arduino input....when '1' come,labview add it with second '1' and becomes 2 ,3,4 and so on..
Offline LIFA Installation WITHOUT VI Package Manager!!! I try to find a way for install Labview Interface for Arduino (LIFA) without vi package manager as an easy second way! Now i like to share a guide about how can easily do it! All steps noted in note file in shared .rar file. Hi good afternoon, I am trying to make an interface for reading load cells, I am using a digital analog converter SPI protocol variant with two wires. what I want is to display the output signal ads1230 mind binary and back view in kg or lb. I hope you can help me. I have faced many problems during my project,only this forum helped me. We have a project and we are working with URM37 v.4 ultrasonic sensor. We are finding many problems while writing the code, so I want to ask you if anyone worked with this type before and if you can help us with a labview code. 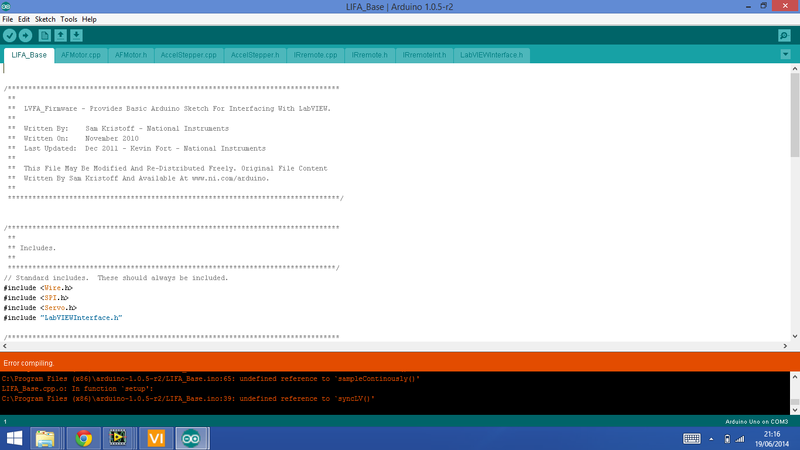 i opened LIFA_BASE.ino on Arduino 1.6.0 but it didnt compile and message occured !! So, I have the Arduino software 1.0.5 (1.6.0 will not upload LIFA to my arduino uno) and it can upload the blink example and the LIFA to the arduino uno. It all seems fine up to here. Then I try to run one of the VIs or just initiatlize the arduino uno with the arduino labview drivers and I get that darn 5002 error. I have checked everything and reinstalled everything, so I am not sure what to do next to try to get the arduino working with labview. Any thoughts? Do you have to do anything with NI-MAX? Have you see these low-cost robots for Arduino! Great way to learn and have lots of fun, too! Anyone having issues with the lifabase sketch in Arduino IDE 1.0.5? I used it a few months ago then came back to install it on a different Arduino and now for some reason it won't compile. I tried uninstalling the Arduino for labview package from VI Package manager, then reinstalling and got the same errors. LabView runtime version only supported? I followed the install procedure but the VIPM does not find the LV runtime installed. Is the student version required, as the minimum install? How do i upload the lifa_base.ino onto the board? I am currently trying to use the arduino leoardo to interface with the labview but when downloading the firmware file on to the board it says error in the code. Problem with upload LIFA to UNO, Need Help! I have install LIFA and also LINX. I tried to upload LIFA to my Uno board, but there is some error I found. i am using a Adruino to display my state form the labview application. I would like to use the Adruino also for other tasks like a 12V relay or temperature measurment. Is there a way to use multible adruino tasks in the same vi? Displaying informations on the lcd screen works fine but i cant use mulible tasks with the adruino. In my notebook is not compiling the LIFA_BASE what should i do? Is possible that the problem is with the new version of arduino software? Hello my problem is that. I am able to control only one led and the other one, i am not able to control it. for this problem of mine. I can't deploy Lifa- base code to arduino! I'm from Brazil, and I need your help! I started to work with interface Labview/ arduino mega2560, and I can't deploy Lifa- base code to arduino! I am doing a project for school to control a DC motor using an Arduino Uno card. I want to know if it is possible to modulate the voltage output on any of the pins. What I would like to try to do is connect a dial input from the front panel that would allow me to increase and decrease the voltage to the motor. When testing the Arduino card I found that I get 5 volts out however my motor is rated at 1.5-3 volts. So I would like to be able to reduce the amount of voltage and be able to adjust it from the front panel. Can anyone help me do this? 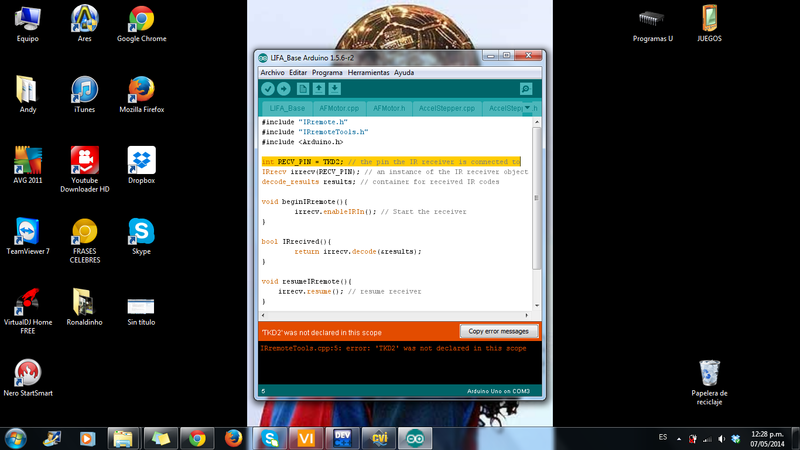 Arduino: 1.5.5 (Windows 7), Board: "Arduino Uno"